Christmas time is fast approaching! This fun gift is sure to brigthen the season for a special little one in your life! 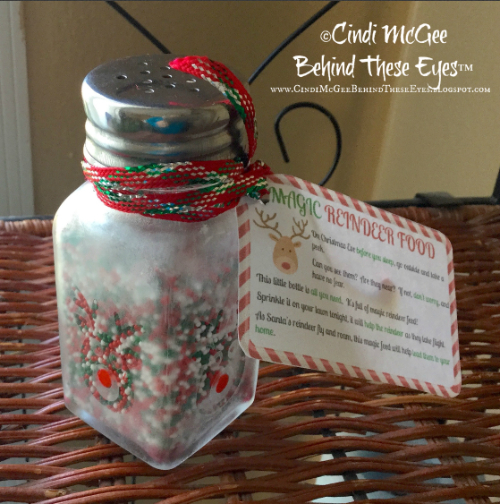 They will have their own bottle of “magic reindeer food” to help lead Santa’s reindeer to their yard! I used the electronic die cutting machine to resize a reindeer image I found online and cut 4 about 1” in diameter from etchmask®. Weed area around reindeer and any un-needed inside sections. Place piece of transfer sheet over the reindeer image and press to adhere. Wash and dry salt shaker. Center reindeer on side of bottle and press to adhere, then remove transfer sheet backing sheet from etchmask image. Apply a thick coat of etchall® Creme to all sides of the bottle. Let set 15 minutes. Return excess cream to bottle. etchall® Creme is re-usable! Wash bottle and remove etchmask. Let dry. 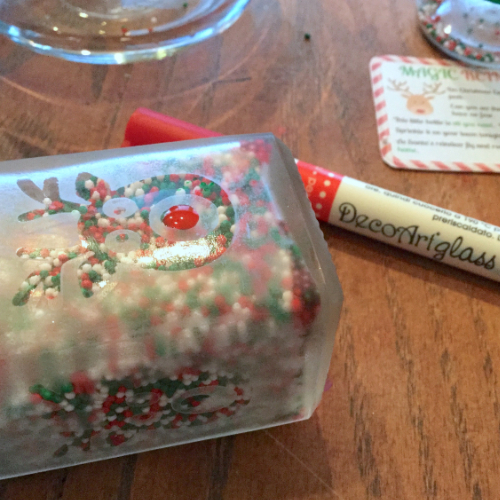 Use red DecoArt® Glass Paint Marker™ to color the reindeer noses red. Let dry. Design and the “instructions” as desired and print. Make a small hole in one corner and tie to the bottle with the ribbon. I found the verse I chose to use on my tag here on Pinterest. 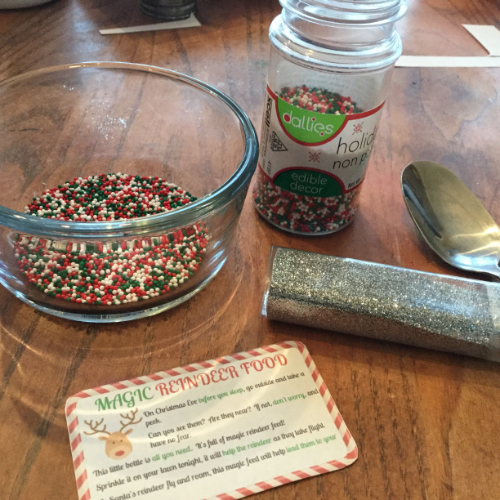 To add to the sparkling holiday fun, mix a small amount of fine silver glitter with candy sprinkles. Fill shaker with mixture. Caution: if you choose to add the glitter, be sure your little one understands this is reindeer food and not people food…… if you want your little one to be able to enjoy a little reindeer food on their favorite reindeer Christmas cookies, then just omit the glitter! Replace cover and tie ribbon around lid. Cute as cute can be! Tutorial and pictures great! Thanks! !